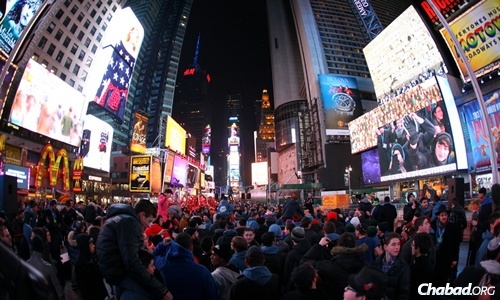 More than 1,000 Jewish teens from 110 communities around the world sang and danced in New York City’s Times Square following the conclusion of the JewishSabbath and a Havdalah ceremony that also featured a surprise concert by British hit songwriter and singer Alex Clare, and a special message for youth broadcast on a giant Jumbatron display. Teenagers from the United States, Canada and Europe were in New York for a weekend of inspiration, education and entertainment as part of the CTeen (Chabad Teen Network) International Teen Shabbaton centered in the Crown Heights neighborhood of Brooklyn, N.Y. Many came with their local Chabad rabbis and had the opportunity to immerse themselves in Shabbat for the first time, as well as get a dose of the city that never sleeps. Participants stayed with host families in Crown Heights. 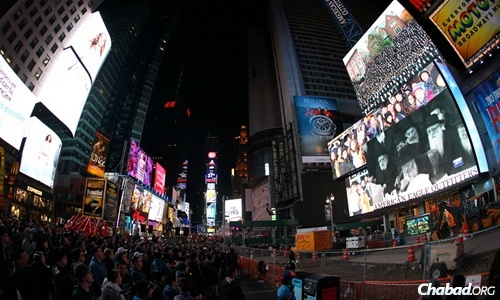 On Saturday night, the 10 jumbo screens on the American Eagle building overlooking Times Square broadcast footage of teens performing mitzvot at their local CTeen chapters and at CTeen's two-week summer traveling camp. 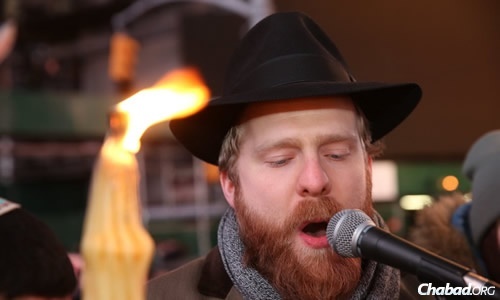 Also shown were the Havdalah service and concert, and peaked with a video of the Lubavitcher Rebbe—RabbiMenachem M. Schneerson, of righteous memory—speaking of the power and potential of young people to change the world. At the CTeen Leadership Choice Awards ceremony during the Shabbaton’s closing banquet on Sunday, Rabbi Yehuda Krinsky—chairman of Merkos L’Inyonei Chinuch, the educational arm of Chabad-Lubavitch—spoke about how Rebbe believed in every young person’s ability to add goodness to the world. “I wish I was your age,” he said, as he charged the teens with the mission to use their abilities to their fullest potential. Teen leaders were presented with awards by both rabbis, who commended them for their efforts in strengthening their local CTeen chapters, as well as for their involvement in planning and arranging programs with the international leadership board. Rabbi Mendy Kotlarsky, executive director of Merkos L’Inyonei Chinuch Suite 302, which oversees the CTeen program, closed the farewell banquet on Sunday by reading greetings sent by President Obama in honor of the Shabbaton.